A horse always highly regarded by the stable, Nordic Duke looked good breaking his maiden in easy fashion at Bendigo on Thursday. Still a bit green, the three-year-old who put on display his natural talent when stakes placed at Flemington back in April, did a bit wrong but was able to really sprint clear over the final stages – saluting by 1½ lengths. A $77,500 Karaka purchase for Paul Moroney, Nordic Duke (bred by Sir Patrick & Lady Hogan and raced by Ballymore Stables, Lorne Bloodstock, Noel Griffin, Manfred Krauser, Neville Scurrell, Peter Reynolds, Peter Walker, Rupert & Cheryl Legh Racing, Gurners Bloodstock and CWL Racing) is by the royally related Gr.1 winner Viking Ruler. Boasting an intriguing pedigree, he hails from the same family as his sire – Viking Ruler and his dam both descendants of the legendary Eight Carat. Hopefully there is more success to come for the stable this weekend with three nice horses to take their place at Caulfield on Saturday. First up is import Don Carlos who lines up in the third event, the Sportingbet Handicap over 1700m. Running nicely first up in the Gr.2 Makybe Diva Stakes, the five-year-old will appreciate a drop in class and slight rise in distance. Nicely drawn in barrier six, Don Carlos will be ridden by Kerrin McEvoy. 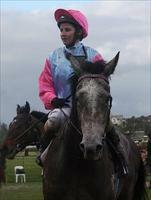 As will Platinum Passion (pictured) who is third up over 2000m in the fourth race, the Perri Cutten Plate. Shylock’s Daughter has unfortunately also drawn poorly (16) in the final event, the Programmed Property Services Handicap but she ran nicely last time out and Lisa Cropp is back aboard. “Lisa knows her well and the mare goes well for her,” Moroney said, adding that this would most likely be the seven-year-old’s last run this preparation. Just the one runner for Ballymore on Sunday, stayer Linton Street contesting the 2200m Showcase at Bairnsdale – looking very well placed from barrier two with Lisa Cropp aboard. Brazilian Pulse meanwhile heads to the paddock, a few niggling problems throughout her preparation setting her back.